Run off? What's that? Where is it? Why am I guiding the Bitterroot in the middle of May, AND having great fishing? Sometimes you just have to quit thinking about things so hard, and just "Go Fishing!" Usually, we are playing around with a few trout in our two acre spring pond behind our house during our spring run off in May. Catching a few like these below, and having the kids help us drag them in! 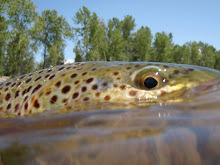 For the past ten years, excluding last years excellent water conditions, I have been telling my regular clients and new ones as well, not to come out to fish Montana in the last week of July and the first week of August! It's just been too hot, and the water has been too warm. Not last year though, it was truly a thing of beauty, with water conditions more like the "good old days", that kept the trout more than happy ALL summer long! We are absolutely in for another summer just like last year now. Our spring has been one of the coolest ever on record, and as I mentioned, the Bitterroot is fishing like a champ at this very moment! Add that to this last winters incredible snow pack and get ready for cold, clean water all season. I think the incredible flush that the Bitterroot took last May and June, coupled with the fact that there were no real forest fires to speak of, has the condition of the river in an extraordinary shape that we may not see again for a long time,( in the month of May that is ). Last summer, for the first time in at least ten years, I was having some of my regular clients meet me late in the afternoon for our day of fishing! The hopper fishing was incredible from the word go! Ant's, beetle's and crane flies gave up some great dry fly fishing until dusk. Then after a quick break and a snack (maybe some smoked steelhead with cream cheese and crackers, (occasionally followed by a good cigar and a beer)), we would then proceed to have some of the most incredible dry fly action one could ever imagine! Ever! May fly spinner falls, caddis flies, crane flies, little sally stoneflies of every color you can think of, you name it, they were on the water everywhere. With all this going on the fish went one hundred percent "brain dead", I mean "dumb"! Rising fish numbering in the hundreds, in the main seam. That's just ONE seam I'm talking about to, The main current for crying out loud! Sure we may have not been getting to the boat ramp until 10:30 or 11:00 at night, but it was worth it. What a blast! As I looked out the window yesterday, and saw yet another flurry of snow come sailing out of the mountain pass by my house, I realized we are in for the same "good old days" kind of summer again. Just thought I would throw that line out there if anyone's trying to think of something fun to do this July and August. The water is finally trying to rise here in the valley (supposed to be in the eighties by Monday), but salmon flies and goldens will be here before we know it. The "dry fly paradise" that is Montana will flow downstream on into our next fishing phase with open arms here on our end. Green drakes, PMD's "oh my". It never ends here!